The average payday loan is £250. The interest Wonga receives on that is an average of £150. But the lender is facing a wave of compensation claims and the cost of processing each of them - whether the borrower's claim is up held or not - is £550. A year ago, 90% of all claims were "organic". That means the borrower initiated the claim him or herself. Only 10% came through claims management companies (CMCs). Those percentages have reversed with 90% now coming through CMCs leading to a big rise in absolute claim numbers. CMCs have taken to "weaponising volume" - as one industry insider told me: "The lenders have to respond to each claim within 8 weeks. The CMCs know this and so wait till they have accumulated hundreds or even thousands of claims and drop them on the lender in one go and start the clock. "Up against this pressure, the lenders are more likely to pay out as they don't have the time to sift through the merits of each case." Even if they had the time - as already pointed out - they lose money whether they win or lose. 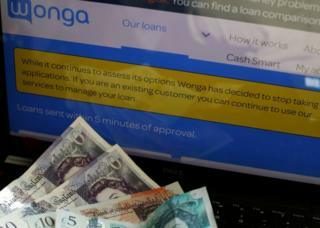 Wonga raised £10 million from its investors at the beginning of August. Three weeks later they confirmed it was running out. There is no new income coming through the front door as millions leave through the back.